For some reason, I've always been fascinated by the Victorian traditions of mourning: black crepe, hair brooches, mourning jewellery, funeral etiquette and the list goes on. (Here's a great summary of Victorian mourning etiquette from author Tracy Chevalier). When I heard about the lead character in Christine Trent's Lady of Ashes, I just knew I had to read this book. Set in London in 1861, Violet Morgan is married to Graham Morgan, of Morgan Undertaking. Contrary to the social expectations of the time, Violet performs all of the duties of an undertaker; a position usually performed by men alone. 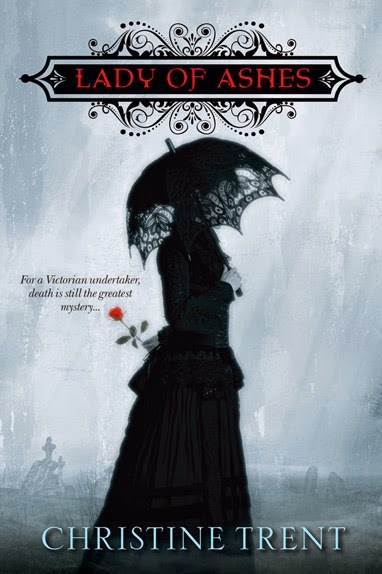 There was plenty of funeral and mourning etiquette sprinkled throughout Lady of Ashes, but unfortunately I always 'noticed' when Trent was dropping more of her research into the tale. Having said that, I didn't mind so much because I couldn't get enough of it. What I did mind was the storyline about the American Civil War. When immersing myself in Trent's gripping world of undertaking in misty London, I couldn't raise any interest in the American Civil War, which unfortunately became an important part of the plot. The Trent Affair is also significant to the plot regarding Graham Morgan, and I couldn't understand the relevance until it became clear that the author had personal ties to this event in history. Ultimately it explained Graham's behaviour in the novel but there could have been so many other ways to accomplish the same outcome and keep the entire story set in London. The unexpected appearance of Queen Victoria was a very welcome addition and I was often prompted to research aspects of her life with Prince Albert (Prince Albert of Saxe-Coburg and Gotha), so interesting was her portrayal in the novel. The architecture was incredibly evocative and I was happy to lose myself in this time and place; researching the buildings and locations in my own time. The scenes in Lady of Ashes featuring Violet preparing a corpse for funeral were tender and gripping at the same time, the highlight of the novel for me. (Oh, and her friend with the messy dressmaker shop).